At question time in the Dáil last week, Deputy Seán Fleming (Fianna Fáil, Laois-Offaly) asked the new Minister for Communications, Climate Change and Natural Resources Denis Naughten to support putting the North-South electricity interconnector underground using high-voltage direct current technology. He asked the Minister if he would make a statement on the matter. Deputy Shane Cassells (Fianna Fáil, Meath West) also asked the Minister if he would support the undergrounding of the North-South interconnector using the technology now available. Will the Minister put a halt to the current plan?, he enquired. Deputy Cassells said the current EirGrid proposal for which planning permission was being sought would destroy the landscapes of Meath, Cavan and Monaghan if monstrous pylons were to be constructed in these three counties. Deputy Denis Naughten: In fairness, all Deputies in the region have contacted me at this stage on this issue. EirGrid is the designated transmission system operator. Its roles include the operation, maintenance and development of the electricity transmission network in Ireland. As detailed in the government policy statement on the strategic importance of transmission and other energy infrastructure, the government does not seek to direct EirGrid in the development of energy infrastructure to particular sites or routes or technologies. EirGrid made a formal application for a North-South 400 kV interconnector project to An Bord Pleanála on 9th June 2015. This is the subject of a statutory independent planning process and is currently before An Bord Pleanála. Part of this process included an oral hearing that concluded last month. As the planning process is still ongoing, it would not be appropriate for me to comment further. Deputy Shane Cassells: I am appealing to the Minister, on behalf of the people of these counties, to become involved because this is a major issue for Meath, Cavan and Monaghan. Not only would it destroy the landscapes of these counties, it would destroy people’s homes. I have sat in the homes of people throughout County Meath. These monstrous pylons will be built beside their homes and will destroy their lives. It is amazing to think that in 2013 the EirGrid chairman, John O’Connor, sat before a Dáil committee and said he would not want to live beside one of these pylons. However, he seems to think it is good enough for the rest of the people in these counties. The North East Pylon Pressure Campaign is led by Aimée Treacy and Padraig O’Reilly. They have spearheaded a campaign to stop the project but they are being thwarted by the formidable legal people of EirGrid. I was at the High Court hearing some months ago when the project was challenged. The Minister’s office, under the previous officeholder, and EirGrid used powerful legal teams to fight against the community groups. We need the Minister to stand up for the people rather than EirGrid. EirGrid is spending money relentlessly on public relations campaigns to try to curry public favour, but it is destroying people’s lives. I appeal to the Minister to get involved and arrange to put these pylons and cables underground. The people need the Minister to stand up for them. Deputy Denis Naughten: I understand the frustration among people in this case, but the government does not direct EirGrid on what mechanism it should use. We need an interconnector. People agree that we need an interconnector. The debate has been how that connection would be made. The government has not directed EirGrid in any way in this matter. This project is before An Bord Pleanála at the moment. An Bord Pleanála has weighed up the options and all the arguments on all sides. We are going to get a decision from An Bord Pleanála. I have read some of the numerous reports into undergrounding. However, the reality is that the North-South transmission project is required to ensure security of supply of electricity to Northern Ireland. The existing 225 kV double circuit overhead transmission line between Louth and Armagh is simply insufficient to meet the needs. Deputy Shane Cassells: The Minister referred to the An Bord Pleanála hearing. I was there and gave evidence at the hearing in Monaghan as well. Representatives from EirGrid came in on numerous occasions during the hearing and changed aspects of their application during the hearing. They came with images that bore no resemblance to the application. These people are ruthless in the pursuit of their aim and do not care about the people. This Chamber is here to care about the people. The government can most certainly become involved. The previous two Ministers had no wish to hear from the people’s side. Therefore, I am appealing to the Minister not to read out the material prepared by the Department but to listen to the voices. This can be stopped before the September ruling by An Bord Pleanála. We need to see an intervention by government in this respect. Deputy Denis Naughten: I have listened to a number of Members from the areas concerned, all of whom have expressed their concerns on this matter. I have not yet come across one person who takes the view that we do not need the interconnector. It is needed because if the existing line were to go down, there simply would not be enough electricity reaching the north east of the island to keep the lights on. Deputy Shane Cassells: I agree with the Minister. Deputy Denis Naughten: We have a single electricity market and we need it. It is helping to drive down the cost of electricity for every person throughout the country. Deputy Shane Cassells: The point is that it should be done underground. Deputy Denis Naughten: I hear what Deputy Cassells is saying and I have heard and listened to what other colleagues in the House have said as well. I understand the frustration that exists but a statutory process is ongoing. Deputy Shane Cassells: The frustrating thing is that Pat Rabbitte said the project would drive up prices. Deputy Denis Naughten: Prices are not being kept high. No one in this country can keep prices high because they are unregulated. There is an open market. Representatives of ESB tell me the company makes little of its money from the Electric Ireland arm. Thankfully, ESB is in the black and making profits a little short of €300 million. A considerable amount of this profit comes from other arms of the company, including the network and electricity generation arms. I am told that of the pre-tax profits generated by the ESB, approximately 14% relate to the retail arm. Other companies in the sector make margins as well. It does not seem to me to be excessive. The Commission for Energy Regulation is accountable to the House and the relevant Dáil committee. I call on Deputy Barry to make direct contact with the Chairman of that committee and bring the commissioners before the committee to quiz them on the issue. Deputy Mick Barry: There the Minister goes again. Like Pontius Pilate he is washing his hands of the situation. I will ask the Minister a far simpler question. How does the Minister feel about the fact that consumers in this country are paying the second highest electricity rates in the European Union, while, at the same time, the ESB is making profits which, whether we use the Minister’s figures or my figures, run to hundreds of millions of Euro? Deputy Denis Naughten: Electricity prices are higher here than in most parts of Europe. However, we need to remember that Ireland is on an island. We have a small electricity market. It includes the North and South and we have had reference to the single electricity market on the island of Ireland. There are geographic issues. The other point is that we have to important a substantial amount of our energy. We are not self-sufficient in the energy sector and that adds to the costs. As a result of the size of the market, there are additional transmission costs and such costs are not incurred in continental Europe. As a result these particular challenges are built into the cost. I am not trying to wash my hands of it. By law I cannot directly intervene in this matter. However, Deputies can question the Commission for Energy Regulation. I am calling on Deputy Barry to use the tools available to him in the parliamentary committee to raise these questions. Tydavnet Show is preparing for its 65th event in August, making it one of the longest running and most successful agricultural shows in Ireland. Once again the hard-working voluntary committee has been working busily behind the scenes since the end of last year’s show. It will be a show with something for everyone, young and old, from the cattle and horse enthusiasts to those competing in home industries and those who just want an enjoyable day out. Every year at the launch of the show programme, the committee invites a guest speaker. In the past, they have included personalities such as the journalist Frank McNally, Mairead McGuinness MEP and last year the former Governor of Mountjoy prison, John Lonergan. This year’s speaker they invited Tony Ward from Lough Egish. An accountant by profession, he is Director of Finance at “The Wheel”, the leading support and representative network for the community and voluntary sector in Ireland. In an inspirational address, he spoke about losing most of his sight when he was in his mid-20s, and overcoming the setbacks this impairment had brought. In recent years he has completed five marathons and three long-distance cycles, and has represented Ireland in middle distance races in the European and World Athletic Championships. He won a bronze medal in the word cross-country championships in Portugal in 2001. Tony reminded the audience how in his earlier years he had played football for Aughnamullen and had suffered a number of bad defeats by Scotstown! He explained how he had grown up on a farm. When he was diagnosed with retinitis pigmentosa (a degenerative eye disease causing severe vision impairment), he said he was not sure what would happen to him in the future. 65 years of the Tydavnet show was an extraordinary and great testament to the local community. Tydavnet, after all, was not the centre of the universe — a comment that brought laughter from the attendance. But it was an incredible record and proof of a lot of hard work by local people. He pointed out that other Monaghan villages such as Latton, Cremartin, Magheracloone or Killanny did not have their own shows. Mr Ward hoped they would get good weather for the show. He explained how he was really interested in sport and would sometimes get up early in the morning to go training, when he would usually have someone to accompany him. He spoke of how two winning athletes at the Sydney Olympics had explained that the secret of their success amounted to 10% self-belief, 10% talent and 80% hard work. He said there was clearly a sense of community and dedication in Tydavnet. Their roots were in farming. The one thing he could think of when he received his diagnosis was the work he did on the farm to assist his father at weekends, putting on his wellingtons and doing chores like milking the cows. When his sight deteriorated he could still go out and bring the cattle into the milking parlour. Tony told the audience it was really important to preserve country and farming life. He recalled how he used to read through the Tydavnet Show results in the Northern Standard. What the show committee had achieved so far was great and he hoped they would pass it on to the next generation. PRO Barry Sherry welcomed the sponsors and said the show would not be a success without them. He welcomed representatives of the Armagh and Clogher Valley shows. He said Tydavnet remained one of the major shows in the country. It took a lot of effort and commitment for it to happen, with lots of hard work from the beginning of the year. After a thirty-year absence they had revitalised the Show Queen competition. They held a very successful night in April when Sinéad McCarey from Barratitoppy was selected for the title. Unfortunately she was not able to join them for the launch of the show programme. Chair of Tydavnet Show Peggy Treanor from Clontybunnia welcomed the national school pupils who were prizewinners in the art competition for designing the cover of the programme. She also thanked the sponsors, advertisers and judges for their support, as well as the landowners at Drumshevra for making the site available for the show. The stewards, helpers, committee members and officers had also shown dedication and enthusiasm and she thanked them all. 1st prize, Aoibhe Genoe, Magherarney N.S., Smithborough. She received a €50 Eason voucher. 2nd prize, Grace Kelly, Tydavnet N.S. 3rd prize, Eimear Treanor, Tydavnet N.S. The border town of Clones with its rich monastic past has the potential to be developed as a heritage destination, according to the Minister for Regional Development, Rural Affairs, Arts and the Gaeltacht, Heather Humphreys. She suggested a monastic trail could be established in the borderlands area, linking Ireland’s Ancient East and the Wild Atlantic Way in the west. The Minister was speaking at the launch at the Canal Stores of a digital pictorial record of the High Cross in the Diamond and St Tighernach’s Tomb Shrine. The laser scan of these important monuments was carried out earlier this year by the Discovery Programme, the national archaeological research body, following a €5,000 grant from the Minister’s department. She said the detailed 3D work would make it easier to preserve and restore the High Cross, which was a focal point in Clones. “I want to see the cross fully restored, and I would like to see Clones marketed as a monastic heritage town. The Discovery Programme, which carried out this 3D scan, has compiled hundreds of digital images of similar historical objects around the country”, the Minister said. The images are available on various platforms including mobile phones. Former Bishop of Clogher and medieval expert Dr Joseph Duffy of the Clogher Historical Society said the project showed the importance of our monastic heritage. Clones had been seriously under-estimated in our time, he said. He was particularly interested in the dating of the cross by archaeologist Professor Tadhg O’Keeffe of UCD, showing it was almost contemporary with the Viking invasion., dating possibly between 875AD and 925AD. Dr Duffy told the Northern Standard the digital models would help to open up a whole new vista of our heritage that had not been previously realised. He said the detailed images of the high cross including the stonework figures captured by the hand-held scanner used brought up the variety of skills and highly developed and refined craftsmanship in medieval Ireland. He was impressed by the images of the cross that had now been recorded for posterity and could be viewed on the 3D-Icons website. Minister Humphreys said the scanning and digitisation of the Clones cross was a very important first step as part of the project to restore the monument to its former glory. She had officially launched the 3D-Icons project last year in the Royal Irish Academy. She saw how much interest and excitement it had generated amongst some very learned scholars. The programme promised to make our built heritage much more accessible and appreciated. That promise had been delivered upon in Clones, where our local heritage had literally had new life breathed into it. Clones was rich in monastic heritage and this announcement was a very important step to help us understand more about the high cross. Historic buildings and archaeological monuments formed an important part of our cultural heritage, a heritage that it was important to value. Historic monuments were the physical testimonies of European history and testified to the diverse cultures that led to the creation of the rich European landscape they knew today. 3D scanning was now becoming an increasingly popular way to document built heritage. Well over 100 well-known buildings and monuments had now been scanned and modelled, including the Hill of Tara, Derry’s Walls, Skellig Michael, Glendalough, Clonmacnoise, Knowth, Newgrange and over seventy high crosses, including Clones Market Cross. The 3D-Icons project was a great example of how projects could be developed that combined technology with all aspects of heritage. The Minister congratulated local communities for their co-operation with and facilitation of such projects. In Clones she had had a very constructive meeting on the possibilities of developing Clones as a heritage destination. As a former monastic settlement, Clones had a huge amount to offer. She wanted to look at ways to enhance the town and attract new visitors. She said there was no intention at the moment to move the cross from its present position and any such change would not be done unless it was in co-operation with the local community. If there was substantial erosion to the stonework in the next twenty years or so, then they now had a digital record that could be used to construct an exact replica. This would also allow them to put the original cross in a place where it was protected from the weather. Archaeologist Dr Finbar McCormick who is originally from Rockcorry and attended secondary school in Monaghan is a senior lecturer at Queen’s University Belfast and Chair of the Discovery Programme. He hoped that with the support of the Heritage Council, they could run outreach programmes to promote an appreciation of Ireland’s archaeological past. County Monaghan has a rich heritage, he said. Dr McCormick praised the work done by Monaghan County Museum since its foundation in 1974 as the first local authority funded museum. He praised the foresight of the late George Cannon, the County Manager at the time, and the work done by the Clogher Historical Society, one of the earliest such groups to be established in Ulster. He explained how the new scanning technology would enable experts to monitor any erosion of monuments and to record them for posterity. Professor O’Keeffe gave a short lecture on the history of the Market Cross. Standing in the Diamond in Clones, the cross is made up of at least three fragments consisting of the head of one cross and the shaft of another, a stepped stone base and a later fragment on top. 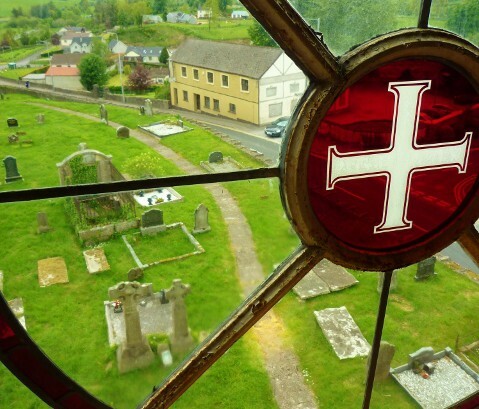 He said this was not surprising as Clones was an important medieval religious settlement dedicated to St Tighernach, whose tomb shrine is in the medieval churchyard. It would have had a number of crosses on its boundary and within its domain. The cross belongs to a northern group of crosses, another example of which is located at Arboe, Co.Tyrone on the shores of Lough Neagh. As with many Irish high crosses it was difficult to date, especially as it was made up of various fragments. In Professor O’Keeffe’s estimation some of the fragments may date to the ninth or tenth centuries, the main period of construction of high crosses. The iconography follows the pattern found elsewhere: the shaft depicts ‘Daniel in the Lions’ Den’, ‘The Sacrifice of Isaac’, ‘Adam and Eve with the Tree of Life’, ‘The Adoration of the Magi’, ‘The Wedding at Cana’ and ‘The Multiplication of the Loaves and Fishes’. Beaded decoration runs up sides of the two faces and also around distinctive collar at top of the shaft. The head of cross includes a Crucifixion scene while at the centre of south-west of head is another depiction of ‘Daniel in the Lions’ Den’, with ‘Cain slaying Abel’ to left and possibly ‘Pilate washing his hands’ to right. Professor O’Keeffe pointed out that an enduring paradox of early medieval Christianity in Ireland was that its great works of art such as its high crosses, illuminated gospel books (such as the Book of Kells), and rich altar plate (such as the Ardagh Chalice) had been produced to serve a Church which invested very little in built fabric. Contemporary Irish churches were small, ill-lit buildings, capable at best of holding no more than several dozen people at a time. Viking raids in the late eighth and early ninth centuries certainly disrupted the pattern of production at church sites in Ireland, but their impact was not fatal. In fact, the Viking contribution to medieval Irish civilization was ultimately very positive, he said. The EU-funded 3D-Icons project aims to create highly accurate 3D models along with images, texts and videos of iconic and internationally important monuments and buildings across Europe and to provide access to this data on line. The pictures from Clones can be accessed at www.3dicons.ie. As voters go to the polls today in the six counties of Northern Ireland and Britain to decide on the future of the United Kingdom in the European Union, politicians from various parties in Monaghan and other border areas of the Republic have been urging a “Remain” vote. Minister for Regional Development Heather Humphreys spoke to farmers in Co. Down on Monday evening at an event in Castlewellan organised by SDLP MP Margaret Ritchie. Minister Humphreys said facts have been drowned out by rhetoric during the referendum campaign. Unfounded allegations had been given the same status as evidence-based research. This had left many people feeling confused and unsure what to do. As someone who lived on a farm just a couple of miles over the border, this was an issue that was very much close to her heart. Being part of the EU had brought many benefits to Northern Ireland. Britain and Ireland’s membership of the EU had been an important part of building better relationships and in underpinning the right of people in the North to be British, or Irish, or both. There had been hundreds of millions of pounds of PEACE funding. Access to the single market helped to create jobs. The Minister said she believed, as did her government colleagues in Dublin, that the best interests of this island, north and south, were best served by having the United Kingdom at the heart of Europe – leading, not leaving. She did not underestimate the challenges a ‘leave’ vote could create. This was especially true from a trade perspective, especially for the Irish agri-food sector. She was very conscious that along the border there had been a very complex set of relationships along the agri-food value chain. Much of the milk produced in the North was processed in the South. Cattle wee fattened in different farms on either side of the border before being slaughtered on one side or the other. The Ulster Farmers Union had said that no compelling argument had been made that Northern Ireland agriculture would be better off outside the EU. Why risk changing a formula which, whilst imperfect, was delivering for farmers today? Rural communities were the lifeblood of Ulster and had been supported by the EU. Projects like the Rural Community Network or the ARC project in Fermanagh had helped to keep rural communities alive. They helped us take advantage of the stability and certainty which the Good Friday Agreement gave Northern Ireland. The Minister continued: “Leaving the EU would leave Northern Ireland open to many risks. The Open University economist Leslie Budd concluded that leaving the EU could cost the Northern Ireland economy almost £1bn a year. He said that transaction costs for cross border trade could rise significantly and act as a disincentive to economic co-operation. The reality would be that, under certain exit conditions, the UK would have the freedom to move away from EU policy. Given the degree of interconnectivity between agriculture and agri-business North and South, any differences would add to the cost and complexity of farming. Under most scenarios, a British exit from the EU would see the return of some sort of border controls, customs or administrative procedures that would replace the current free movement of goods. One would have to anticipate a higher level of administrative controls than currently exists, with possibly a “hard” border and/or a Border Inspection Post. This was stated by Prime Minister David Cameron last week. “Inevitably any restoration of the border, even a customs border, would add to farmers’ administrative costs. We all remember the old border in Newry. The queues of trucks. Who wants to go back to that?”, she said. “It is in your interest that the UK, and in particular Northern Ireland, remains in the EU”, she told the farmers. Fianna Fáil TD for Cavan-Monaghan Niamh Smyth said voters in the North and across the UK had the chance to further relations North and South of the border if they voted to remain in the European Union. The Brexit referendum was one of the most historic votes on this island as a vote to leave could have major economic, political and cultural consequences for the whole of Ireland. “Today marks a defining moment in Britain’s relationship with the EU, and it is imperative that those who are registered to vote do so. Fianna Fáil believes a Brexit is not in the best interests of the island of Ireland and we would encourage people to vote to Remain in the EU”. Deputy Smyth said. “We have been very critical of the democratic deficit at the heart of the EU but the only way to change that is from within. We want to change the EU and build a progressive, prosperous and social Europe, which respects sovereignty. Sinn Féin is calling on everyone to Put Ireland First and vote Remain in the referendum”, Mr Kearney concluded. Meanwhile the British Home Secretary Theresa May has warned of border controls in the event of a Brexit. She was speaking during a visit to Northern Ireland to campaign for a remain vote in the referendum. Theresa May said it was “inconceivable” that there would not be changes to current arrangements between the North and the Republic if the UK voted to leave the EU. Ms May said that, while the Common Travel Area between the two countries existed prior to the EU, if there was a Brexit some form of control would be inevitable. Ms May also claimed the economic argument for Northern Ireland to vote remain was compelling. TOM KELLY, the Stronger In chairman in the North, said the Remain campaign was concentrating on getting people out to vote today. “I am very confident that we will win the argument,” he said. However the Northern Ireland First Minister and DUP leader Arlene Foster is urging a ‘leave’ vote. She said she had listened to the arguments on all sides of the debate and after full and careful consideration had reached the conclusion that the right answer was to vote to leave the EU and to take back control of the UK’s future. “Thirdly, I see the opportunities. Many commentators have asked how as a former economy minister do I support a Vote Leave? It was because of my experiences that I believe it is the right choice. I have been across the world and I have seen the opportunities that are out there for the taking. I have seen Northern Ireland businesses take them up. This fills me with confidence and the will to go after them. I have also seen how power flowing down works best”, she said. “Finally, there is one threat to our peace process and one threat alone. Those paramilitary organisations who remain intent on killing are the threat to our peace. A threat the security forces deserve our praise and support for combating every day. Polling stations in the North will remain open until 10pm this evening and it will be Friday when the outcome of the referendum is known. ABP Clones General Manager George Mullan with a group from the Guild of Agricultural Journalists. Photo courtesy of ABP. Irish beef has begun to re-establish its first class reputation on the menus of leading restaurants and the shelves of supermarkets in Britain and Europe. The Bord Bia Origin Green scheme of which the ABP Group is a founder member emphasises sustainability and the reduction of environmental impact. So any development in the agri-sector that could affect the reputation of quality beef is potentially worrying. The ABP Group owned by businessman Larry Goodman is the largest beef processor in Ireland and the UK. It is proud of its record in producing quality Irish beef mainly for export to the United Kingdom and Europe. Various measures are taken at processing plants such as Clones to ensure that high standards are maintained at all times. Visits to the ABP factory in Clones are strictly regulated. Human hygiene is crucial, as in any meat or food plant. On entry to the plant, visitors must wear protective clothing and hairnets, as well as removing jewellery. Footwear must be replaced by wellington boots, which are scrubbed meticulously in a special walk-through unit before entry is permitted to the boning and other sections. Hands must be washed and disinfectant gels applied. The boning plant has different sections and each part of the animal carcass is used up along the line, starting with the hide. By-products are sent to some of the company’s other units. The top class steak cuts were skillfully removed and later packaged, labelled with ABP’s own brand. In the packing hall differently coloured boxes indicated the various countries the meat was destined for, such as the Netherlands, Germany and Italy. Veterinary inspectors from the Department of Agriculture check the carcasses and stamp them before they are processed. Each carcass is given a tag with details of the farm it came from and where it was slaughtered. Photographs are taken of each individual carcass as it passes along the production line. New tags with barcodes are attached and after chilling they are sent to the boning hall. This is to ensure traceability of the meat to help reassure customers at the end of the food chain and to ensure quality can be maintained. The tour of the plant then moves outside to the lairage facility where cattle arrive to be processed. The ABP Food Group say animal welfare is a cornerstone of their business, so they have invested heavily in ensuring that customers can be 100% secure in the integrity of their processes. The company source farm-assured cattle from throughout Ireland (including Co. Monaghan) and the UK. Although the fields of Co. Fermanagh are just a stone’s throw away, the company processes only cattle from the Republic, within a 50 mile distance of the plant. This is because there are special regulations for processing cattle from the North and they could not be handled at the same time as animals from the Republic. ABP worked closely with the bestselling author and world-renowned livestock-expert Dr Temple Grandin to design and plan their facilities and procedures. She approved every aspect of the holding pens (lairage), assisting the company’s goal to ensure cattle are relaxed and stress-free prior to slaughter. There is a special slat rubber system for the cattle to walk on. Not only does this give livestock the respect and integrity they deserve, but the lower pre-mortem glycogen levels and PH balance of stress-free animals make for a higher quality and tenderness of carcass, according to ABP. Dr Grandin campaigned to reduce the prodding of cattle with electric goads by showing a humane approach makes much better quality meat. She designed the lairage with curved solid walls, baffled gate latches to cut down noise, and uniform colour and lighting to reduce stress on the cattle. The curved walls ensure each animal is prevented from seeing what lies ahead and just concentrates on the hind quarters of the animal in front of it. ABP Clones General Manager George Mullan (right) explaining the various stages of processing at the meat plant to Michael Fisher. Photo courtesy of ABP. George Mullan, general manager of ABP Clones, who showed the visiting group around the plant, said since the lairage was opened three years ago he had noticed a huge difference in the behaviour of cattle at the plant. They’re happier animals and calmer at all times, he said. “Animal welfare is a very major concern of the consumer in this present day”, he added. Mr Mullan explained how following slaughter the patented hanging process increased the natural breakdown of muscle fibres in each carcass while it hung and matured prior to de-boning. ABP Food Group has also created a method of sympathetically chilling the carcass to prevent cold shortening and guarantee absolute tenderness in the beef. The Managing Director of ABP Beef (Ireland) Finbarr McDonnell outlined the group’s four divisions. ABP Food Group Ireland is Europe’s leading beef exporter, specialising in beef processing, de-boning and retail packing. It has a long tradition of working with farmers and customers, operating highly efficient factories supplying quality beef to European and worldwide retail markets. The UK branch of ABP is a leading supplier of fresh and frozen meat and meat-free products. It continues to drive innovation in every aspect of business, including collaborative partnerships with customers, to industry leading practices in processing and product development. The ABP Ellesmere development near Liverpool is an example of embedding sustainability at the heart of the company’s operations. Over £20million has been invested to make this plant a carbon neutral operation. ABP Pet Foods is one of Europe’s leading manufacturers of private label pet food, producing 570,000 tonnes every year from seven facilities. C&D Foods with headquarters in Mullingar is headed by Philip Reynolds, whose father set up the original company. Philip sold a majority interest in the business to ABP in 2011. The fourth arm of the group is Olleco, the largest collector of used cooking oil in these islands, employing 550 people. It helps many of the biggest restaurants and catering groups to maximise the environmentally sustainable treatment of waste food and oil products. More than 30 years ago used cooking oil was collected and used in animal feed. When this was banned owing to tighter regulations, a huge amount of used cooking oil ended up in landfill or was illegally poured into drains. Olleco looked at other ways to recover the value from this resource. The company started to collect both used cooking oil and food waste and convert them into renewable energy instead of throwing it away. With fourteen depots across the UK the company is one of the UK’s largest distributors of cooking oils to the catering trade. In 2013 a specialist biodiesel plant was constructed in Liverpool. Capable of producing 16 million litres of biodiesel it is the UK’s largest purpose built plant dedicated to producing biodiesel from used cooking oil. Two years later Olleco opened the first anaerobic digestion plant, providing the heat and power to operate the biodiesel plant. Tallow is collected at the Clones plant and is sent to England for processing. Finbarr McDonnell joined ABP in 1973 and held a variety of positions with the company including Group Production Manager and Factory Manager at the Cahir plant. He was appointed Chief Executive of ABP Beef (Ireland) in January 2008. He predicted that with a market turning its back on Friesian types and a re-nationalisation of the French market, cattle prices could be hit in the latter half of 2016. “It is unfortunate that sterling is where it is and unfortunate that live exports are dead in the water,” he told the Guild of Agricultural Journalists. He urged the country’s expanding dairy sector to prioritise cross-breeding with the traditional Irish Hereford and Angus breeds for which ABP were pushing an open door on export markets. He said the company was ‘concerned’ about how the Brexit referendum next Thursday might turn out. Mr McDonnell said the market was now ten times more in favour of Hereford and Angus than Friesian beef, adding that he was “very worried” about the consequences for the progeny of dairy farms unless they adapted to breeding more for market requirements. ABP currently handled over a fifth of national output, equivalent to 125,000t per year. It planned to expand further on its 41 sites within the EU employing up to 9000 people. The company was optimistic of a successful outcome to its bid to buy 50pc of Slaney Foods within the coming weeks. The move would result in ABP controlling 28% of the national beef kill. A year ago ABP Food Group completed a €50 million redevelopment of its facilities in Cahir, Co. Tipperary. It included an extension and upgrade of food processing facilities as well as the introduction of a new state-of-the-art gel bone production plant at its neighbouring by-products site. A report by Oxford Economics and KPMG found that the upgraded facilities employing over 600 people are expected to be worth over €200 million a year to the local economy in Tipperary and surrounding counties. The plant in Clones employs around 300, with 60% of the staff coming from abroad, including Lithuania and Poland. Based on the Cahir study, this would indicate that the Teehill factory brings in a benefit of around €100 million a year to Co. Monaghan and the surrounding area. This is taking into account employment created by the factory in subsidiary areas like haulage and canteen supplies. ABP is one of the largest employers in the county. It also contributes to the local community through charitable activities such as sport. Freddie and Caroline Merrin farm land at Ballyloughan, Lough Fea, outside Carrickmacross. The Merrins operate a weanling to beef system and have received Bord Bia awards for their product. They are members of the 150-strong Monaghan Quality Cattle Producer Group that supplies cattle to ABP in Clones. Freddie is originally from Killanny and Caroline comes from Kells, Co. Meath. The farm is 170 acres and there is a similar acreage on a long-term lease from the adjoining Lough Fea estate. The Merrins are helped by their three children, Emma, George, and Linda, a Leaving Certificate student at St Louis secondary school, Carrickmacross. Emma and George are both attend UCD, studying history and science respectively. Weanlings are grazed and finished out of the shed as either bulls or steers the following winter. The sheds are multi-functional and there is a huge emphasis on grass utilisation. At the moment there are around 700 cattle on the farm. Freddie bought in 350 calves over a five-week period starting in mid-February. He would usually go to the mart in Bandon to buy them. After a spell in the sheds the calves are out out to grass between mid-May and mid-June. Bull calves would usually be brought to be killed before 24 months and heifer calves before 20 months. When it came to sending them to the factory there could be no room for sentimentality, Freddie said. ABP Group Livestock Manager Paul Mathews said the company was investing in genetics and had its own herd for research. He said they needed to build up a strong database about breeds and they were working alongside the Irish Aberdeen Angus Association. The Merrins enterprise was one of the best examples of a family farm amongst their suppliers, according to the company. On the occasion of his fortieth anniversary as a priest, Monaghan native Bishop Noel Treanor of Down and Connor has urged Catholics to continue to foster ways and means of promoting the human dignity of every person and to find new ways of doing so, like in the European Union. It was a new way, never a perfect one, pooling sovereignty and promoting the common good. We have a massive task to promote the social and ethical, he said. Bishop Treanor is from Tyholland. The inspiration for the celebration in Belfast on Monday evening came from fellow Monaghan man Canon Brian McCluskey from Inniskeen, a retired priest of Clogher diocese and an assistant at St Brigid’s parish in south Belfast. He realised that the Bishop’s ruby anniversary coincided with that of the parish priest of St Brigid’s Fr Eddie O’Donnell and organised a joint celebration. Two other priests who concelebrated Mass were Fr Sean Emerson PP Antrim and Fr Patrick Winkle CC from Youghal in Co. Cork. Bishop Treanor thanked Canon McCluskey for his friendship over the years. He said there was clear evidence in the parish of the difference everyone could make together in the community, in the diocese and in the world. It was great to see in St Brigid’s parish and in many others that people were joining them from different countries such as Brazil, the Congo, the Philippines and of course from Monaghan! This was most important at a time (in Europe) when there was a danger of rising nationalism. “We have to open our doors and find new ways of living, working and managing society”, Dr Treanor said, “in order to promote and foster the dignity of every person”. Fr Eddie O’Donnell thanked Bishop Treanor for sharing the ruby anniversary celebration. He paid tribute to Canon McCluskey, who he met for the first time six years ago when he came to the parish. Brian was now a good friend and he couldn’t do without him in the parish, he said. At the start of the Mass Bishop Treanor said he was privileged to share forty years of priestly service with Fr Eddie. He recalled that the day of his ordination (13th June 1976) was a very warm day in Monaghan during a beautiful and glorious summer. The ordination by Bishop Patrick Mulligan (centre) of Fr Noel Treanor (left) with Fr Duffy and Fr Daly at St Macartan’s Cathedral Monaghan June 13th 1976. From the files of The Northern Standard June 18th 1976. The Northern Standard recorded the occasion at St Macartan’s Cathedral when the Bishop of Clogher, the late Dr Patrick Mulligan, ordained Fr Noel along with Reverend Laurence Duffy, Magheracloone (now Parish Priest in Carrickmacross) and Reverend Michael Daly, Killanny (PP Donaghmoyne). Bishop Mulligan said in his homily forty years ago: “This is a day of rejoicing and gladness for the diocese to see the Church in Clogher renewing itself in the ordination of these young men to be priests…The Church lives and grows through its priests— preaching, offering Mass, taking the place of Christ among God’s people. Without priests the Church dies, the work of the redemption does not bear fruit. Thank God we have had enough priests in every generation to maintain the life of the Church…May Our Lord give these young men and all priests the rewards he has promised to those who leave all things to follow Him both in this life and in the life to come”. Bishop Treanor said along with Fr Eddie he wished to thank his family, relatives and the local communities who had nourished and supported them in their vocation. He also thanked the parishioners of St Brigid’s for the support they had shown to Fr Eddie since his appointment as Parish Priest. He reflected on how they were both children of the 1950s and 60s. They grew up in the era of The Beatles and in Monaghan, country and western music with stars such as Big Tom. They had been ordained with many others in 1976, a time of great hope and aspiration. They had moved through times of great change and scandals, even in the church. They had seen the arrival of different forms of fundamentalism and the rise of nationalism, which were recipes for war. But they still stood as a Christian community proud to serve the living word of God for our times and faith. Looking back over forty years they were thankful. There had been much water under the bridge and now they must look to the future as people of hope. There was now a good balance between laymen and women and ordained priests working together to make parishes a welcoming place and centres of faith that were also part of a diocesan and a world church. Following the ordination of Fr Treanor a reception was held in Tyholland parish at Leitrim old school where he had been a pupil. From the files of The Northern Standard June 18th 1976. Bishop Treanor spoke of the need to find new ways of catechising for young people. He hoped there would still be Catholic schools in fifty years’ time. But if that was not guaranteed then the church might have to provide Sunday school education for faith. He referred to the vibrancy of the Catholic church in places like Brazil, India, Korea, China and Myanmar and hoped that people from these countries would bring a freshness of experience to the church locally. They gave thanks to their forebears for the gift of faith and prayed they might hand it on to the next generation. At the end of the Mass Fr O’Donnell told the congregation he had wanted a quiet anniversary, but Canon McCluskey had plotted with the parishioners to hold a double celebration. He described Canon Brian as a special friend, who he could not do without “in spite of his hang-ups with Monaghan GAA and the poetry of Patrick Kavanagh!” Reflecting on the shortage of new vocations, Fr Eddie said there was a great psychological difference in asking “do you need priests?” and “do you want priests?” If you said “want” then you were more likely to do something about it and gain the courage to ask a son or relative to consider seriously Christ’s call. Canon McCluskey spoke afterwards during a meal organised at the parish hall. When he first met Fr Eddie six years ago, he had resided in the parish for a number of years (since his retirement from the diocese of Clogher). When he got into conversation with him, one of the first things he told him was that Monaghan had a (GAA) football team, something Fr Eddie didn’t know! They were gifted that a Monaghan man had been sent to lead this diocese. He himself had been the precursor, the John the Baptist figure preparing the way for Bishop Noel to come to Down and Connor. Canon McCluskey said this would be a night to remember, the night of the great feast, just as people in the past had recalled the night of the great wind. Bishop Treanor was born on Christmas Day 1950 at Silverstream, Co. Monaghan, in the parish of Tyholland. He attended St Brigid’s National School, Leitrim, and completed his early education at St Mary’s CBS, Monaghan. In 1968 he began his study of Arts and Philosophy at St Patrick’s College, Maynooth, and in 1971, commenced the study of Theology, achieving his Licence in Sacred Theology with special commendation in 1977. Following his ordination he was sent by the late Bishop Mulligan to the Irish College in Rome to pursue his studies of theology at the Pontifical Gregorian University. Recalled in 1980 by the then new Bishop of Clogher, Most Revd Joseph Duffy, he was appointed assistant in the Cathedral parish, in charge of the local Catholic Marriage Advisory Council. From 1981 to 1985 he again pursued the study of theology in Rome, while at the same time serving as Prefect of Studies at the Irish College. Having returned to his Diocese in 1985, he was appointed Director of Adult Education. He organised a diocesan assembly of clergy held in 1986 to promote pastoral renewal within the diocese. His next appointment was as a curate in Enniskillen, where he also provided service at the general hospital and was active at Lough Derg pilgrimage centre. In 1989 he was sent to Brussels to work with the Commission of the Bishops’ Conferences of the European Community, COMECE. While deeply involved in the expanding endeavour of this Church body to project Christian values into the European process, he continued to engage in pastoral work through contact with the English-speaking community in the city. He also published and lectured widely on European construction issues, the Church and Europe, and Church-State matters. On March 31st 1993 he was unanimously appointed Secretary General of COMECE for a three-year term and was reappointed for several successive terms since then. In May 1994 he was nominated Chaplain to His Holiness. His appointment as a Bishop was announced by Pope Benedict XVI in February 2008 and he was installed at St Peter’s Cathedral in June that year on the feastday of St Peter and Paul. Fr O’Donnell was ordained for the Down and Connor diocese at St Patrick’s church Donegall Street in Belfast. He is a native of Magherafelt in County Derry and celebrated his first Mass there. His brother, sister and cousins attended the anniversary Mass. Fr Eddie as he is known went on to serve as a hospital chaplain before being appointed diocesan Secretary in 1982-1991 during the stewardship of Bishop Cahal Daly. He served in Antrim, Newtownards and was parish priest of St Anne’s Derriaghy before being appointed by Bishop Treanor to St Brigid’s in 2010. WILL A NEW CASEMENT PARK HOST ULSTER FINAL IN 2020? As Monaghan took the first step in Clones on Sunday towards retaining the Ulster football championship, the GAA in Ulster is proceeding with plans to start re-building Casement Park stadium next year. The first matches at the new £77 million ground could be played in 2019 and Casement could be ready to host its first Ulster senior football final in July 2020. President of the Ulster Council Michael Hasson, an Antrim man, has welcomed the progress made on re-launching the plan. He said since opening in 1953 Casement Park had played a significant role in the development, promotion and profile of Gaelic Games in Belfast, Antrim and across Ulster. The GAA as a proud community organisation embedded in communities and open to everyone thrived on community spirit. The Casement Park project, he said, represented an opportunity to invest in a community that the Association was proud to be a part of. Mr Hasson told the Northern Standard he hoped the new Casement Park would be able to host the Ulster final. But he stressed that this did not mean the end of Clones as a major venue. On the contrary, the GAA was keen to develop Clones to be on a par with the new Kingspan Breffni Park and with the re-developed stadium in Belfast, the biggest urban centre in Ulster. He himself was a member of the committee planning the redevelopment of Clones. Last year on two separate occasions the GAA President Aogán Ó Fearghail stated that the GAA would never abandon Clones as a venue for major games. He told members of Monaghan County Council that Clones had nothing to fear from a major redevelopment at Casement Park. But he stopped short of guaranteeing that St Tiernach’s Park would remain as the exclusive home of the Ulster football final. He said Clones was the same as Breffni and there would always be a significant need for it. The original plans for the new stadium on the Andersonstown Road in West Belfast to host up 38,000 people were drawn up in 2012 and lodged with the planning service in July 2012. But they ran into difficulty soon afterwards and a legal action was taken by a group of local residents opposed to the project because of its size. A civil servant also raised concerns about crowd safety issues. In the meantime Ulster Rugby’s Ravenhill ground and soccer’s Windsor Park have both had millions of pounds pumped into their redevelopment by the Stormont Executive. When the plans for Casement were first published it was envisaged that the stadium would open by 2016 but so far no work has taken place and the main gates remain locked. Former Department of Culture Arts and Leisure Minister Carál Ní Chuilín stated that money for the Casement Park redevelopment had been “ring-fenced” by the Executive. But there are fears that with a new team at Stormont and a DUP Minister, the development process could drag on, leaving the GAA in Ulster without a new state-of-the-art stadium while soccer and rugby will benefit from the latest facilities. Casement Project Manager Stephen McGeehan said the GAA was now willing to consider a capacity below 38,000, the number of seats in the original redesign plan. As the Association launched a fresh round of community consultation about the proposal, he said the GAA had no intention, and never had, of knocking people’s houses down, or of purchasing or demolishing anyone’s homes to make room for the stadium. Since 2014 when planning permission for the redevelopment was overturned the GAA has been working on a new planning application. The GAA said it wanted to hear feedback from people in west Belfast and further afield about the proposed stadium design. It organised a number of consultation initiatives. The Northern Standard was shown the details at one of three public events held in west Belfast last month. The GAA intends to submit a planning application before the end of this year. Under the new timetable, work would start on the new stadium by the end of next year and the ground would be completed by the end of 2019. The hope would be to play the first Ulster provincial final at the new Casement Park in summer 2020. The GAA said the redesigned stadium would take into account the fears over the emergency exiting arrangements in the original design. But they have not yet put a figure on the proposed capacity. Local residents had wanted a maximum of 25,000 spectators. Stage 2 of the consultation will take place in late Summer/Autumn when detailed plans will be available for review along with the findings of the Environmental Impact Assessment. The consultation will go above and beyond the twelve weeks process required, extending over a twenty-week period. The GAA said they would welcome views about all elements of the new provincial stadium from the local community, interest groups, the wider GAA and other relevant groups across business, arts, social and sports. The use of the Stadium for large scale (18,000 attendance) music events will be restricted by the seasonal nature of both the sporting calendar and the weather conditions which in effect will limit this use to not more than five days a year. Support for the project has come from a number of local GAA clubs. Michael Davitt’s GAA Club on the Falls Road in West Belfast said it was vital everyone showed support for the Casement Project. Hopefully, we will all be able to demonstrate a favourable impression and show there is a really strong support within Antrim County for the new Casement Park stadium.,‘Let’s build Casement!’ was their message to supporters. Because of the closure of Casement, some important Antrim games are now being played at Corrigan Park in west Belfast, home of St John’s GAC. The All-Ireland Football qualifier round 1B game between Antrim and Limerick will be held there on Saturday 25th June. Time to be confirmed.